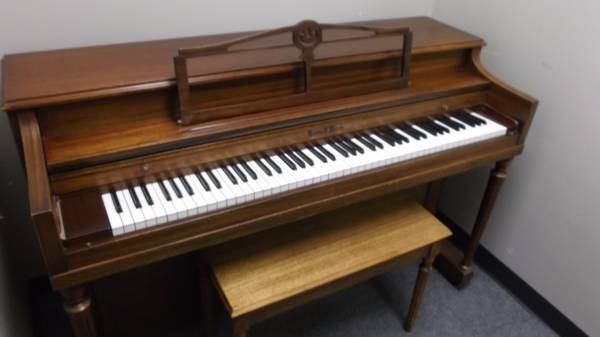 Henry F. Miller Spinet, $249.00 SOLD! A great starter piano, this little piano will not steal too much space from your living room. And it won't be hard on your pocket book, either! It has a lightly bruised cabinet that is never-the-less in a natural wood finish. Comes with bench, with music storage space. Regularly maintained, everything works on this totally useful piano. Made back in the day when Henry Miller still made their own pianos, it is a little piece of American History.